We had planned to get our Christmas tree last Sunday after church. (We put up several artificial trees in early December, but wait until mid-month on the real tree.) 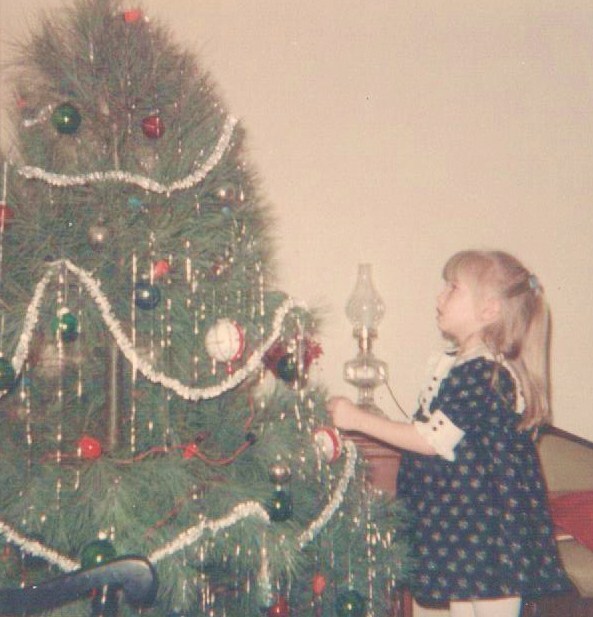 At breakfast that morning, our daughter recounted the dream she’d been having upon waking: H and I had decided to surprise her by going out for the tree while she slept. By the time she came downstairs, we had it set up and decorated. It was not a good-looking tree. D tried to hide her disappointment in not being included in the tree outing, in our choice of an unfortunate tree, in its awkward placement, and in our bad decorating. When she reached out to touch it, the trunk collapsed in on itself like a patio umbrella stand. It had been tall and ugly; now it was short and ugly. Once fully awake, she was greatly relieved to find no tree at all in the living room. Her dream reminded me of some old photos from my childhood featuring particularly unsightly Christmas trees. D had seen them before, but had forgotten, so the impact was strong. These photos have mystified me for years. They were taken in our first house in Atlanta, a little rental ranch in the Montreal Woods section of Tucker. When I think back on the Christmases of my childhood and teen years, I set them in the home we bought two years later, in the Morningside area. 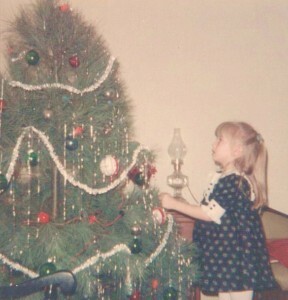 As I remember, it was graced annually with a nicely shaped, well-decorated tree, usually a Frazier fir. Why, then, were these trees, from the more distant past, so very ugly? Upon recent re-examination of the photos, I assumed they showed two different, but equally unattractive trees, from consecutive years. (Dates on our family photos are often missing or erroneous.) The first captures a hulking, bushy tree. I look up at it with awed trepidation. In the second, I sit forlornly beside a presence that resembles a raggedy, monstrous figure, small-waisted and large-hipped. The broad expanse of blank white wall adds a further degree of bleakness. 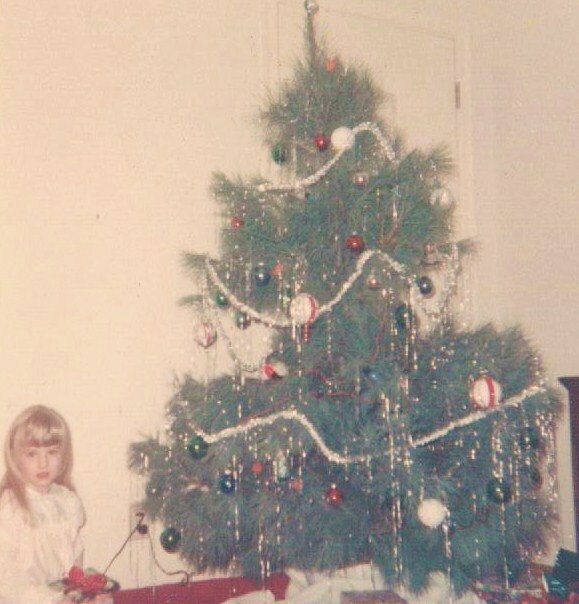 Then I noticed that in another picture of the monster tree, I’m wearing the same black dress and blue barrettes as in the bushy-tree photo. Could we really have had two such sad-looking trees in the same year? Was the first so terrible that we took it down and swapped it for another, late in the season, when the pickings were even slimmer? Maybe the first one kept falling over? (I have vague memories of toppling trees on rickety stands.) Or maybe the needles dried out within a few days? I phoned my parents to see if they could offer any clarification. They didn’t think we ever had two trees in a single year. They did remember that we had some less than stellar trees in the Tucker years. It had to be the same tree, one with the added distinction of looking bad in various ways depending upon the angle from which it was viewed. The same ornaments appeared in similar spots; the same aluminum-foil tinsel was draped haphazardly over long-needled branches. In the photo above, Mama and I seem to be trying to put on a good show, to pretend gamely that we’re perfectly content in the presence of this strange tree. Here we are, happy and well-dressed, holding these gifts expectantly. We could be a family on a Christmas card. 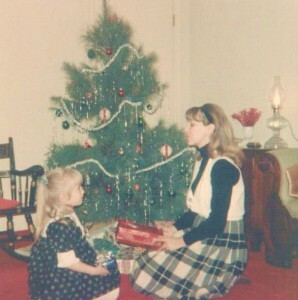 Mama’s memory of that tree was as hazy as mine, but other details of that season she recalled vividly. Ever since she and my father had married, they had spent Christmas with her family in central Kentucky. My birth hadn’t changed this; Christmas would find us in the farmhouse with my grandparents, surrounded by aunts and uncles. But that year, after our move to Georgia, we weren’t traveling. We could have our own merry Christmas, just the three of us. We would. We’d do it. We tried. In the photo above, we continue with the Christmas card images. Mama reads ‘Twas the Night Before Christmas, and I look giddy and act like I’ve never heard it before. We’re both wearing new pink flannel PJs. Our long hair is neatly brushed. Beneath our fake smiles, you can see us grimly willing those visions of sugarplums to dance, dance, dance. It didn’t work out. There were no sugarplums. We missed our family. We missed the big old house. We missed our tradition. It just didn’t seem like Christmas. As a young child, I tended to carry an outsized burden of multiple anxieties, for no reason that could be explained. 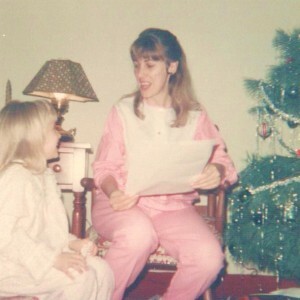 That Christmas Eve, I was sad and inconsolable. I couldn’t stop crying. I was exhausted, but I couldn’t sleep. Mama, loving and patient, sat with me, late into the night, holding my hand and offering assurance. She had grown accustomed to this process, but usually it wasn’t quite so painful or long-lasting. Early the next morning, we packed up the gifts, the wrapped ones and those from Santa, bundled ourselves into the enormous blue Dodge station wagon, and headed to Kentucky. The time would come, soon enough, for starting a new tradition. That year, 1966, was simply not the time.